"We got chills...the fact that our cake touched all of these people." 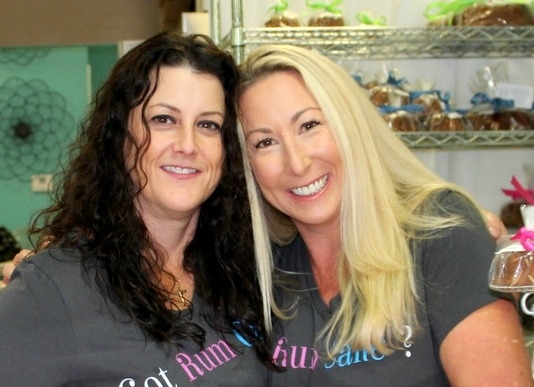 Kelly O'Sullivan and Elizabeth Jones, founders of Rum Sisters. - We shipped more than 500 cakes (out of 1,200 baked) during the 2014–15 holiday season! (We had only been open for a month and half.) During the 2015–16 holiday season, we shipped 2,300 cakes (out of 6,000 baked). ELIZABETH JONES: In July 2014, the aviation business my husband and I run was a sponsor of the Blue Marlin Grand Championship fishing [tournament] here in Gulf Shores, Alabama. As a sponsor, we wanted to provide a memorable [promotional] gift for these high-end clients. Discussing this with Kelly [who has been a longtime friend], we decided to make rum cakes, based on a recipe from my mom Linda Shay. We baked 75 rum cakes in 2 days. When people saw them and tasted them they said, ”Where did you get these? Where can we buy them?” We couldn’t believe the response. KELLY O’SULLIVAN: We share a love for food. We also started drinking together 25 years ago! We’ve been like sisters since the [beginning]…[With the cakes,] we felt like we were on to something. ELIZABETH: We both have been in business but never started something. I’m involved in my husband’s [aviation] business, and I had thought of having something of my own, though I didn’t know what it would be. KELLY: Elizabeth is a great cook. I like to bake. But we had no formal training. We took courses in food handling and safe food processing. We decided to take some samples to Chef Chris Sherrill, an award-winning chef, at the Flora-Bama Yacht Club for his feedback. He liked them enough to say, “Let’s do some for the Kenny Chesney concert coming up [the Flora-Bama-Jama in August 2014] and use his Blue Chair Bay rum. Within 24 hours, we had created a Bushwacker cake and a gluten-free Bushwacker cake. [Bushwacker is a spiked frozen milkshake drink of the Alabama coast that includes rum, chocolate, coffee, and coconut flavors.] Chris tried them and said, “Oh my God. This is it!” He put them on the menu during the free concert, which had 40,000 attendees and took place on the beach in front of the [club/restaurant]. We sold most of the 50 large cakes, served by the slice, the weekend of the concert. ELIZABETH: When the cakes were a success at the restaurant, we created an LLC that same month—Rum Sisters. From there we were very lucky; we found a bakery that was going out of business three months after opening. We signed the lease on October 1, 2014, and opened on November 11, 2014. It was as if everything had lined up for us—finding the bakery space, in particular. We’re in an area that is usually busy in summer months and quiet in the winter; here we had a product for holiday business. KELLY: When we heard the feedback. People tasting our cakes for the first time would say, “Oh my God!” It’s an experience; people have memories associated with the cakes. ELIZABETH: Really by the end of the first week, we were seeing a very positive reception by the local community. KELLY: This was self-funded. We had really low start-up costs. We created one-year and five-year business plans. We fell short on some of the first numbers, but we adjusted the plans. In the first year of business, we didn’t take salaries. We were able to increase our revenue and cut costs after being in business for a year. We were certainly able to leverage our buying power to reduce the cost of goods sold (cogs) as well as increase revenue through social media [marketing]. KELLY: Elizabeth and Kel. We’re like the Three Musketeers (or the Three Stooges…!) It’s a family support system. KELLY: Trust your gut instinct. Don’t let people talk you into something you’re not ready to do. ELIZABETH: You’ve got a great product. Focus on your infrastructure. [That means] standardize your procedures to ensure quality. Ask yourself: Is the foundation strong enough for growth? We’ve had offers and have had to think about this before shifting focus to things like another store, franchising, or bringing in investors. KELLY: The stories we hear are the best moments. Our favorite: A local woman came in a week after she bought a cake and told us that she gave some to her 90-year-old grandmother who has Alzheimer’s. No one had talked with her in years. She ate some of the rum cake, and the woman told us, “Memories were pouring out of her. She had moments of clarity. There were stories and tears from the whole family who was there.” We got chills—the fact that our cake touched all of these people. ELIZABETH: No one thing, but financial decisions we made—too early—that were not necessarily the best—in marketing, technology, and SEO. My advice would be for any food business getting started and thinking of being online driven to [consider] very seriously the choices you make for the website platform and online store options, and make sure you have great technology people to get your SEO in the right direction at the start. KELLY: Coming up with new cakes. It’s been like magic. When we needed to come up with a new cake, we got it each time the first time we tried. Except for one—key lime. The flavors, [key lime and rum] just didn’t mesh. ELIZABETH: Keeping up the pace day in, day out. Staying inspired, because we’re passionate about what we do. ELIZABETH: I didn’t understand what was needed to set up an online business. KELLY: Time management. Although we have two part-time people helping, it’s mostly still just the two of us running the business. ELIZABETH: A quote: “You get what you give.” If I’m giving a smile and great service, it’s going to come back to me. KELLY: A quote: “Failure is not an option.” We started over. This is everything we have. ELIZABETH: We want to increase online sales, and open stores in major cities. We’re building a brand. We’re also starting a charity called Support a Sister. We’re moms first—we each have two boys—and we want to help women who have fallen on hard times.